Continuing our look back at area bridges, this week we show (at left) a “new” one from 1910 that provided access to coal company homes on what is now the 300 block of Mine Hill Road Southwest. The bridge was built across Issaquah Creek near where the new foot bridge crosses the creek at the fish hatchery. 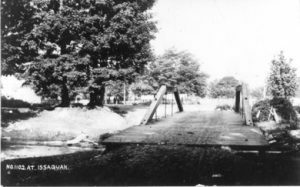 The bridge was destroyed by a flood in February 1932. In 1921, the Town of Issaquah acquired the property on both sides of the creek adjoining the bridge and named it City Park. It is now the fish hatchery and Gibson Hall properties.